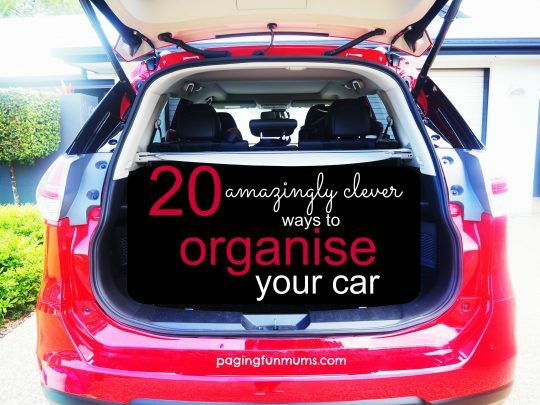 Having kids is not the easiest solution to having a clean and organised car. Let’s face it, sometimes our car can look like a war zone! 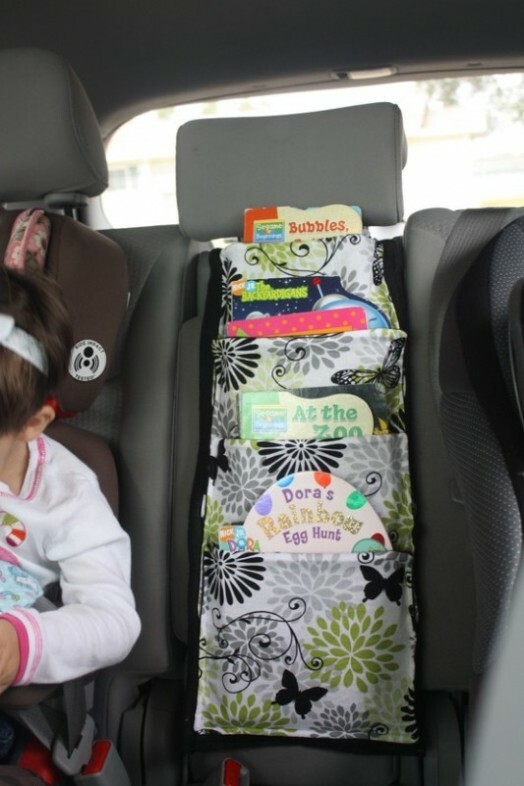 There’s car seats, snacks, toys and a myriad of endless things that make our precious vehicle…well not so precious! 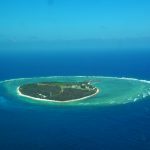 I’ve compiled a list of things that can help you put an end to all of that! Get a Car Rubbish Bag! 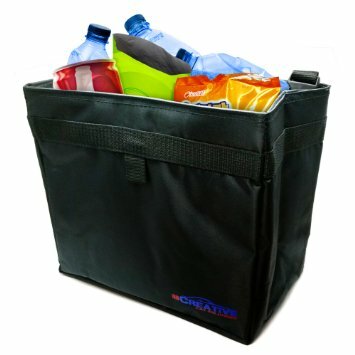 These are a great way to store any rubbish whilst you are travelling to keep it spotless. No more food scraps or empty packets on the floor! Or you can make your own using a plastic cereal container! 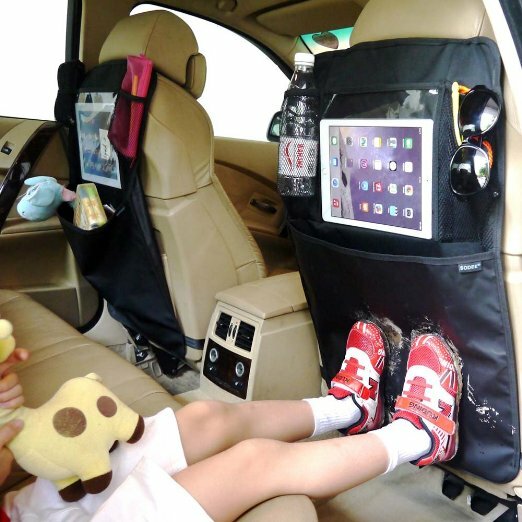 If you’re kids are into iPads or Tablets, then a Kick Mat/Seat Organiser with a Tablet holder is perfect! Great for keeping dirty little feet of the backs of chairs too! 3. 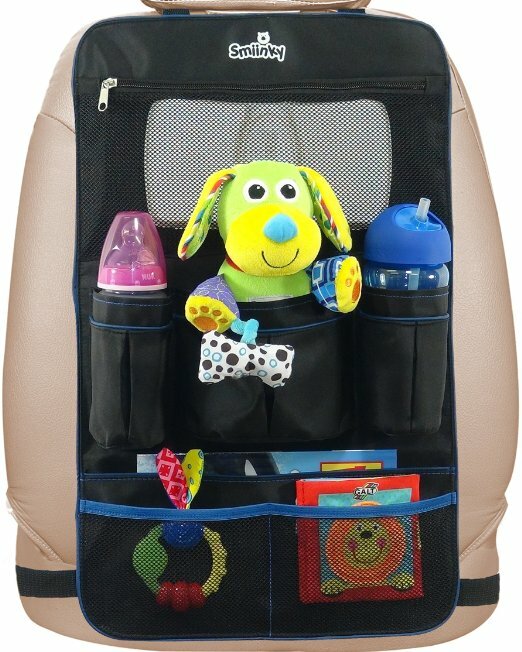 A back seat Toy Organiser. 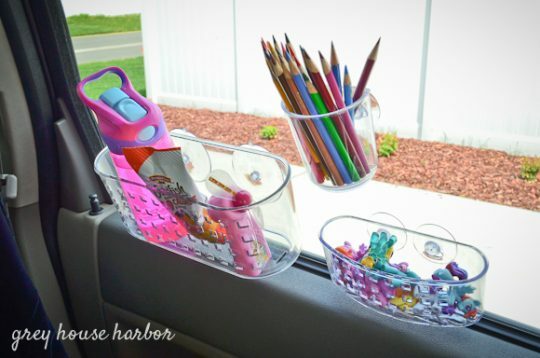 These are a great way to store all of those loose ends that kids like to travel with! 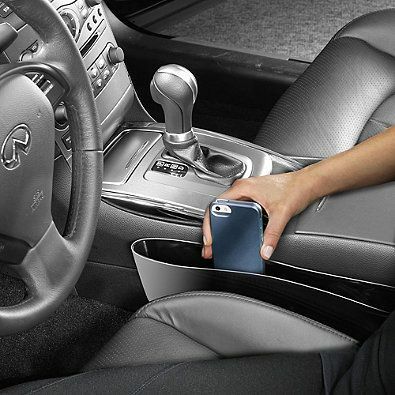 It also keeps them close at hand so you’re not passing things whilst driving. There’s no need for things to be sliding around your car. 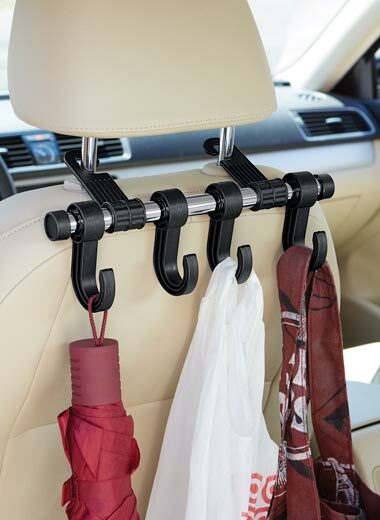 You can use a contraption like this to store umbrellas and bags. 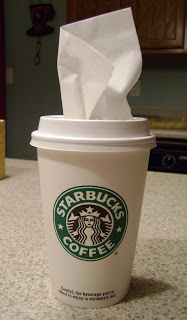 Store your tissues in a holder that can fit on your visor. 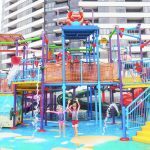 You can even get adorable plush ones that the kids will love! 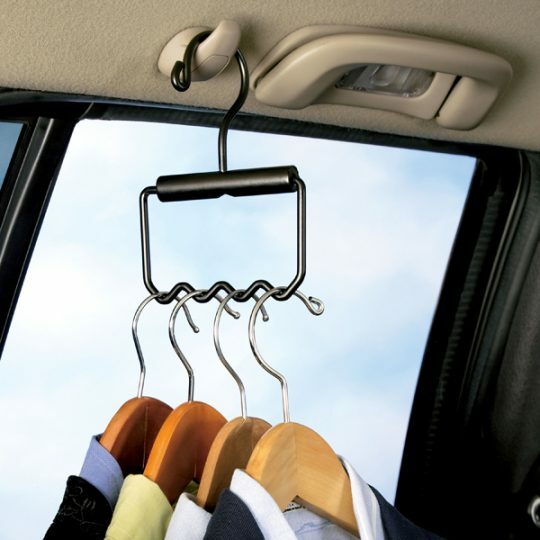 Keep your clothes wrinkle free and transport multiple garments with a Car Clothes Carrier. Great for toting school uniforms, dance costumes, sports clothes and more! Store all of those important documents in one easy file! 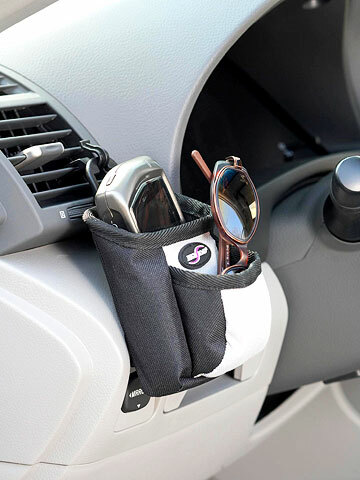 Use your side seat for extra space with a Side Seat Storage Organiser! It’s not being used for anything else, so you may as well keep things off the floor! 9. Use Shower Caddy’s to organise your trunk! You can use inexpensive shower caddy’s to house just about anything! 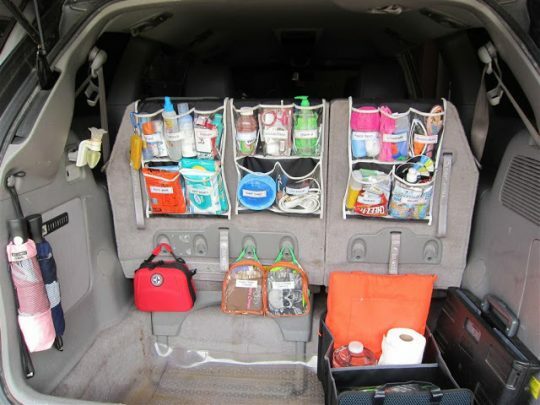 Perfect for draping over the back seats to store sunscreen, wipes, first aid kits, bug repellent, you name it! 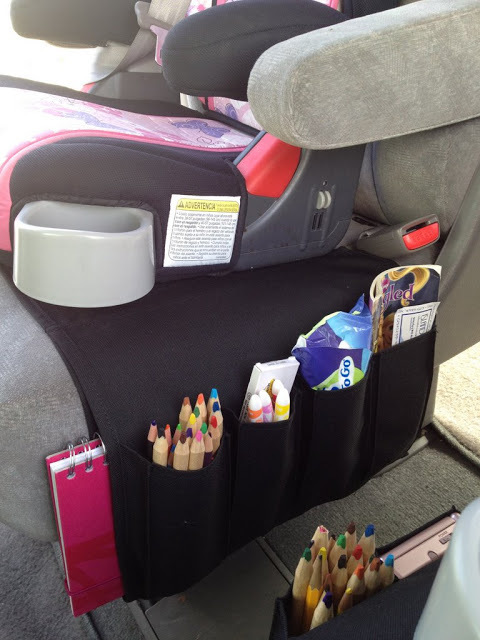 You can run a remote holder like this under your child’s car seat and it will hold pencils, snacks, toys,, books and other bits & pieces kids like to take with them. 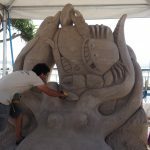 It also helps to protect your seat too! 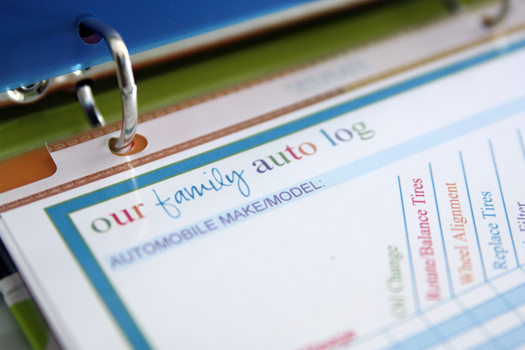 This is a great way to keep track of auto maintenance and to keep track of everything required of your car! 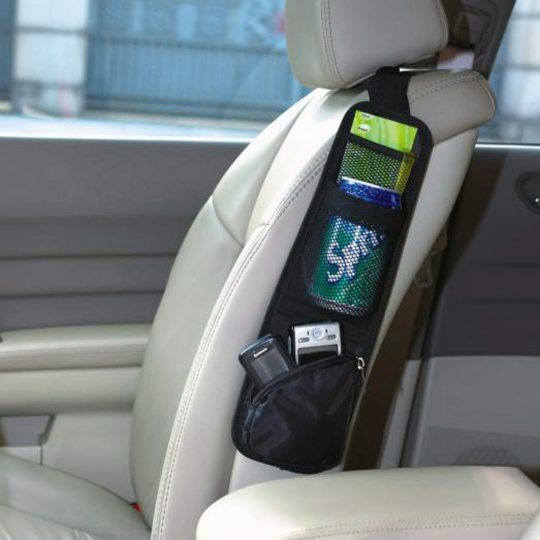 The bag will fit nicely into glove compartments or consoles or you could simply store it under the seat. You could use this for a first aid kit, make up or an entertainment pack for the kids. You obviously want an unused cup for this, but what a genius idea! Just pop it in your cup holder and you’ll always have those ever required tissues at hand. 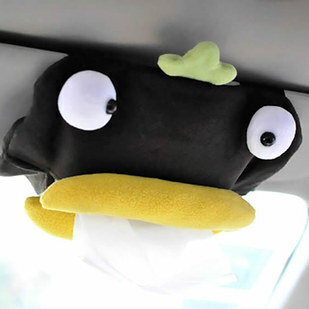 No need for giant tissue boxes floating around the car. You know how you are always losing things between the seats! Well fret no more! Thew cool Catch Caddy’s slot right in the crack between your seats so that never happens again. 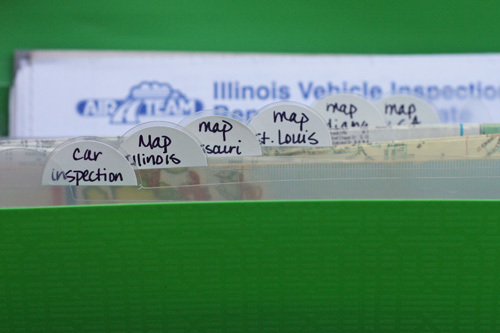 This is an easy way for your kids to access their things on a road trip. 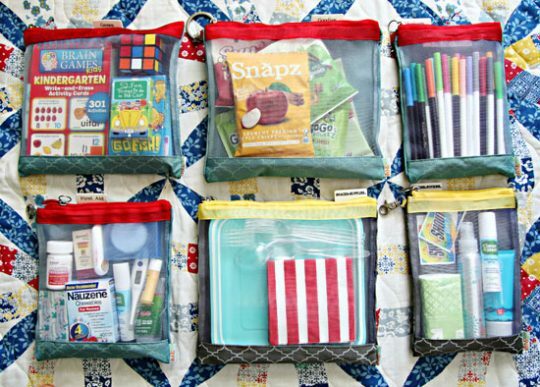 You can use simple clear zippered bags to pack everything for your travels. 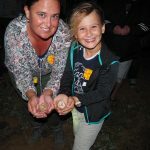 From first aid kids, activity packs to snack packs – you have everything at your fingertips ready to go! Kids love books no matter where they go. 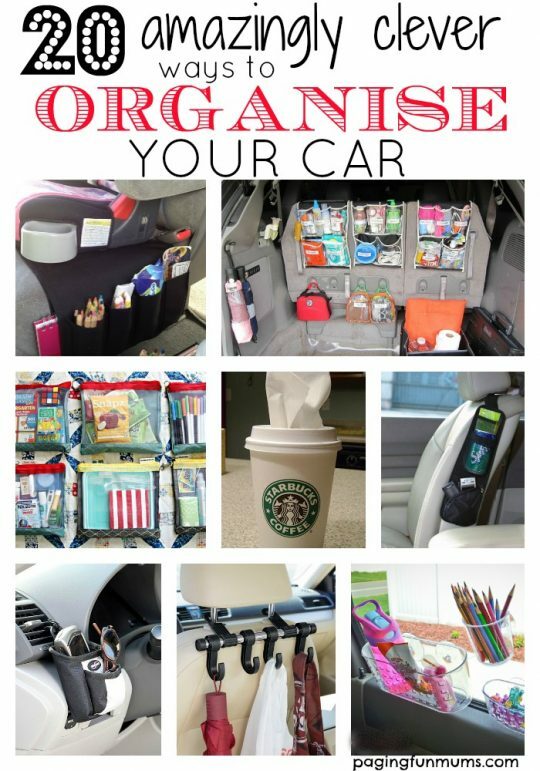 Make sure your car is organised and books have a special place of their own! When you’re a Mum, you never know what you’re going to need at any given time. 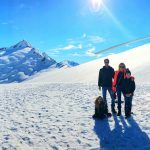 So why not include an ‘Mum Emergency Kit’ in your car! 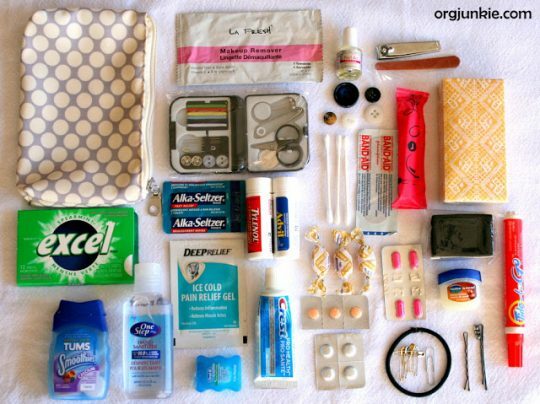 You can add toothpaste, floss, hand sanitiser, panadol, tissues, cough drops, hair ties, breath mints and the list goes on! Clip this little guy to your car and store your phone, sunnies and loose change! Be prepared for that terrible time when you get a flat. 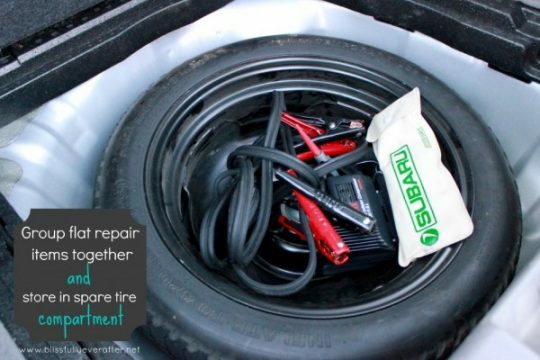 Make sure you have a jack, wrench, tire pump and anything else you think you’ll need and store them in your spare tre compartment. We hope this had given you a few tips! Can you give us any? 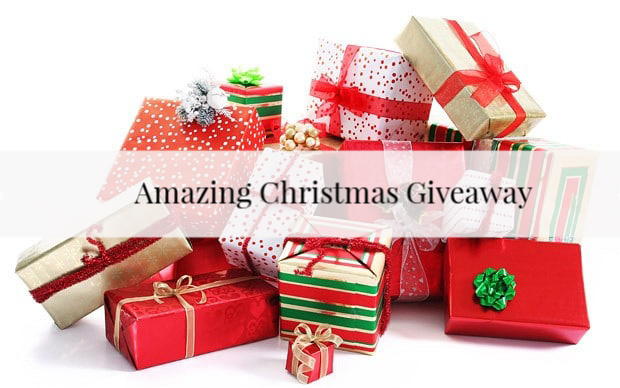 We’d love to hear about them in the comments below!